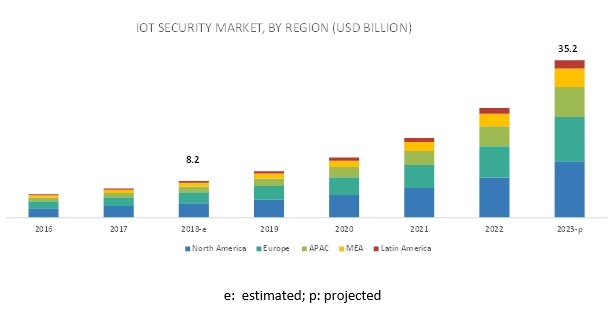 [144 Pages Report] The global IoT Security Market size is expected to grow from USD 8.2 billion in 2018 to USD 35.2 billion by 2023, at a Compound Annual Growth Rate (CAGR) of 33.7% during the forecast period. Major factors driving the growth of the market are the increasing number of ransomware attacks on IoT devices across the globe, growing IoT security regulations, and rising security concerns over critical infrastructures. Network security is a technique for securing networks from advanced threats by collecting and analyzing the different types of network security event information. It combines the multiple layers of defenses at the edge and in networks. It is one of the important aspects when it comes to securing the IoT ecosystem. It consists of wireless communication, remote access security, and gateway. Wireless communication is carried out with the help of various secure protocols, including LPWAN, Zig-bee, 6LowPAN, Bluetooth, Z-Wave, and NFC. In the IoT ecosystem, a huge amount of data is communicated through remote devices; therefore, the security of this wireless communication plays a significant role in network security. Smart energy includes smart meters, smart appliances, renewable energy resources, and energy efficient resources. The organizations in this smart energy and utilities industry primarily focus on 3 aspects while deploying smart energy systems. These aspects are electricity distribution, production control, and electronic power conditioning. The integration of IoT with all these aspects helps reduce costs to develop, test, and deploy the interconnected networks in the ultimate energy grids. Security threats to energy networks include malware injections, denial of service, attacks on privacy, and thefts of data and energy. North America comprises developed countries, such as the US and Canada. These countries have invested significantly in R&D activities, thereby contributing to the development of innovative technologies. The US and Canada are the early adopters of trending technologies, such as IoT, big data, and mobility, and they create enormous opportunities for IoT security vendors. The startup culture in North America is growing at a faster pace as compared to that of other regions. The increasing number of Small and Medium-sized Enterprises (SMEs) and growing digitization trend in different industries are expected to boost the growth of the North American IoT security market. The major vendors in the market include Cisco (US), IBM (US), Infineon (Germany), Intel (US), Symantec (US), Gemalto (Netherlands), Allot (Israel), Fortinet (US), Zingbox (US), Mocana (US), SecuriThings (Israel), CENTRI (Germany), Armis (US), ForgeRock (US), and NewSky (US). In February 2019, Mocana collaborated with Intel to integrate Mocana’s TrustCenter with the Intel Secure Device Onboard service. This new collaboration would simplify IoT device security. In September 2018, Fortinet announced FortiNAC, a new network access control product line, which delivers network segmentation and automated responses for IoT security. In October 2017, Intel announced the launch of Intel Secure Device Onboard (Intel SDO). This technology securely automates and brings IoT devices online within seconds. Where would all these developments take the market in the mid to long term? What are the upcoming industry solutions for the IoT security market? Which region would offer high growth for the vendors in the market? Which solution would gain the highest market share in the market? *Details on Business Overview, Products & Services, Recent Developments, SWOT Analysis and MnM View Might Not Be Captured in Case of Unlisted Companies. The study involved 4 major steps to estimate the current market size for the IoT security market. The exhaustive secondary research was done to collect information on the market, peer market, and parent market. The next step was to validate these findings, assumptions, and sizing with industry experts across value chain through primary research. Both top-down and bottom-up approaches were employed to estimate the overall market size. Thereafter, market breakup and data triangulation were used to estimate the market size of segments and subsegments. In the secondary research process, various secondary sources, such as Hoovers, Bloomberg BusinessWeek, and Dun & Bradstreet, have been referred to, to identify and collect information for this study. These secondary sources included annual reports; press releases and investor presentations of companies; white papers, technology journals, and certified publications; and articles from recognized authors, directories, and databases. The key players in the in the market have been identified through the extensive secondary research. 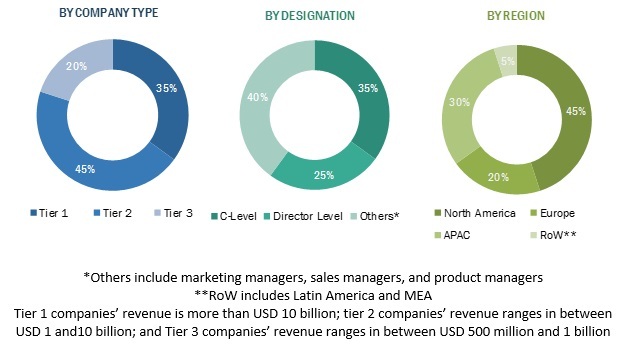 The IoT security market expenditure across regions, along with the geographic split in various segments have been considered to arrive at the overall market size. After arriving at the overall market size — using the market size estimation processes as explained above — the market was split into several segments and subsegments. To complete the overall market engineering process and arrive at the exact statistics of each market segment and subsegment, data triangulation and market breakup procedures were employed, wherever applicable. The data was triangulated by studying various factors and trends from both the demand and supply sides in the IoT security industry. Cisco (US), IBM (US), Infineon (Germany), Intel (US), Symantec (US), Gemalto (Netherlands), and Allot (Israel), among others. A total of 15 players covered. 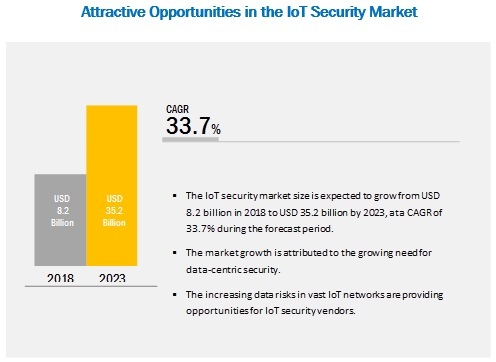 This research report categorizes the IoT security market based on types, components, solutions, services, application areas, and regions.